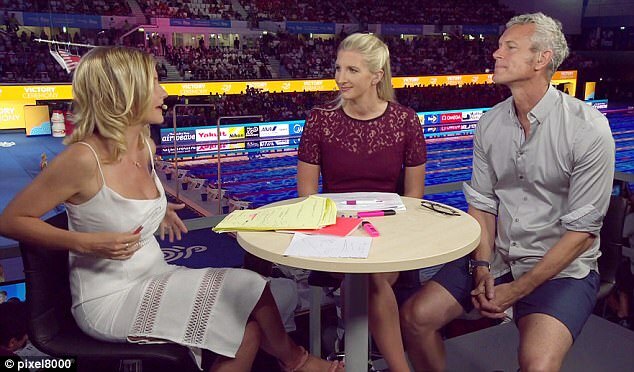 She won a legion of new fans courtesy of her post-baby physique following her return to TV at the World Swimming Championships in Budapest. And Helen Skelton showed off the body that helped win her a new legion of predominantly male fans as she took advantage of the hotel pool during her current stay in France. Taking to Instagram, the popular presenter, 34, showed off her body in distinctive floral bikini while venturing into the water in snap taken by her husband, Richie Myler, 27. But what was meant to be an agreeable snap of Helen relaxing in the pool went awry, with the TV personality revealing her well-meaning husband inadvertently captured her grimacing as she eased herself into the chilly water. Helen has repeatedly impressed fans with her incredible post-baby body, less than four months after welcoming her second son Louis in April. The presenter previously showed off her enviably slender midriff in a pair of low-slung red and white striped bikini bottoms in an earlier instagram post. With her hair in a high bun and donning aviators, she cosied up to her husband of four years, who showed off his ripped physique and tattooed arms in a pair of low-slung blue shorts. Captioning the picturesque beach snap, she wrote: '#summertime #swims #outdoors #rarephotowithusbothin #outdoors #france #familytime #thetoddlertookit'. Helen originally raised eyebrows over her racy sartorial displays during the Olympics coverage in Rio de Janeiro. And she set pulses racing once again as she donned a low-cut dress for a presenting stint at the World Swimming Championships in Budapest. Keeping the focus on her rather than the pool, the stunning blonde flashed her ample assets in the daring ivory number which featured a plunging cowl neckline. The star revealed her slender midriff in the sensational dress, with the garment's spaghetti straps flaunting her toned shoulders and arms. The stunning outfit quickly caused a stir on social media with fans clamouring to compliment the star's toned figure. Another enamoured fan wrote: 'Helen Skelton is worth turning your TV on for' while another loyal follower typed: '@HelenSkelton is just soo damn stunning!! Absolute beauty' followed by heart eyed emoticons. 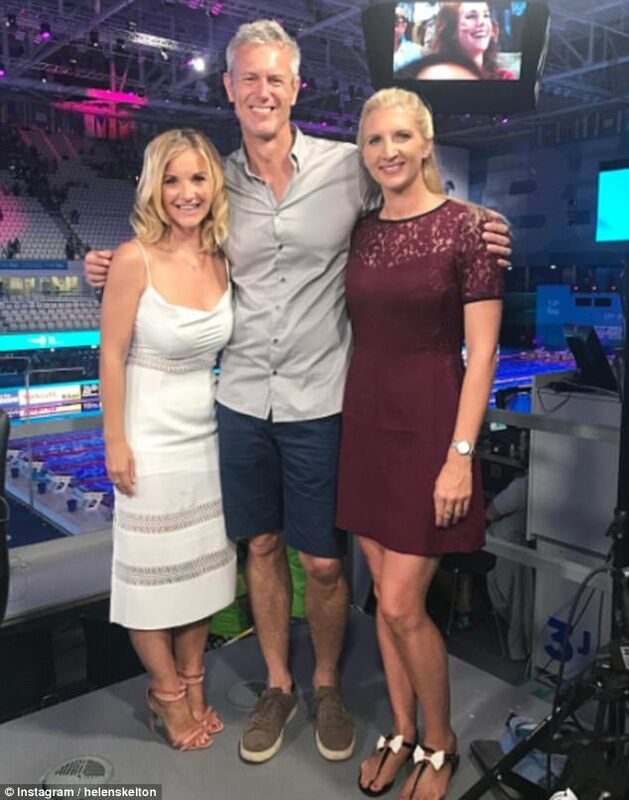 Last year Twitter fans went into meltdown when Helen wore a navy dress with a short skirt in the warmth of the Rio swimming arena, which many pointed out offered more than a glimpse of her enviably long legs. Helen followed up the look with some other daring numbers including a scarlet asymmetric gown. Her outfits were a surprising change of image for someone who had been known primarily as a wholesome presenter of children's programmes and Countryfile. It later emerged she had received help from celebrity stylist Cobbie Yates, who hand-picked a selection of dresses for her to unveil throughout the Olympics. The mother-of-two shot to fame in 2008 presenting Blue Peter, and has taken on a number of extreme challenges and expeditions for charity. As well as running a 78-mile ultra-marathon in Namibia, she has kayaked the full length of the Amazon river and became the first person ever to reach the South Pole on a bicycle.